Before I knew I loved weeds I subconsciously sought them out. I always knew I loved wild and untamed things, unkempt things and things that insisted on living and thriving where they didn’t fit in with a landscaped master plan. I was somewhat aware that certain wild things caught my eye and seemed to cry out for attention. They wanted me to frame them in my photos, and they waved at me from the side of the road whenever I was on a road trip . I was sorting through older photos today and I found this one from the summer of 2007, over six years ago. I took this photo in Willits, California just outside the main grounds of a rustic family friendly campground. My boys, my husband and I spent that summer camping and exploring as we traveled up the coast of California and Oregon, stopping wherever we desired. Most of my photos from that trip feature my children and my husband in scenes of family fun, and they are priceless family vacation photos which bring me back to that magical time and fill my heart with such sweet memories. During my sorting of photos I found this one. I see how the wild grasses wave at me and blow into frame, wanting to be a star. 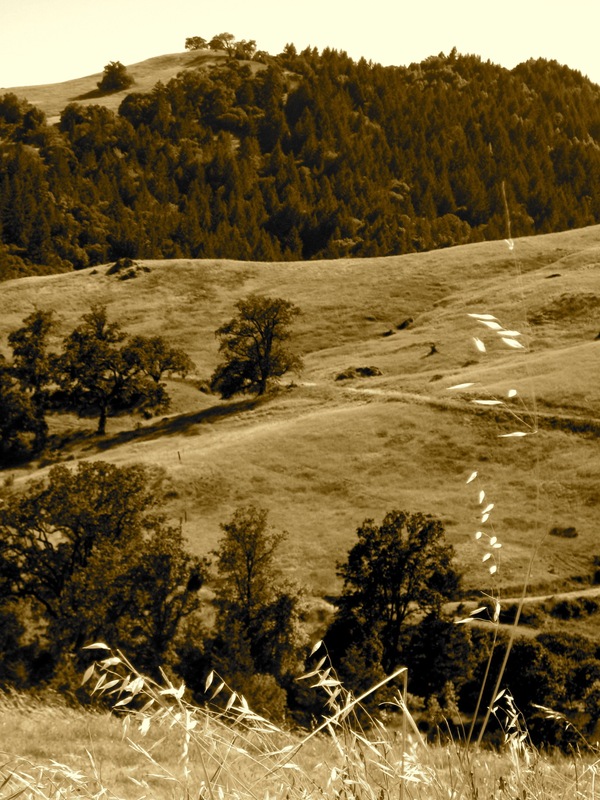 The wild grasses are as an important part of the California view as the mountaintop, the pines and the mighty oaks. The grasses cover the rolling hills and give them their signature California golden color and soft look. When we returned from the freedom of our summer trip we prepared for the start of a new school year, and a new chapter in our family, as my eldest was getting ready to start college and would soon move away from home. We are a close family, and we were well prepared for the change, but I personally was unprepared for the longing I would feel for our intact small family of four, all gathered around the campfire, or together at the dinner table, when our eldest started his adventure at college away from us. So I found myself often longing for that magical summer and I replayed the many happy memories of our trip and our togetherness many many times. We’d seen so much of nature that summer, and much of it had been wild and untamed. So in the months after our return, when I would see a weed in our backyard, or on a neighborhood hike, I would be reminded of the campsites we stayed at and the fun times the four of us had shared together. They were sweet times of treats and togetherness before any changes could separate us. I stopped pulling weeds then and started to welcome them. And so it was that I began to realize I was falling in love with weeds. They took me back to those golden times and to the strength in our family that I knew could withstand anything, even growth and the passing of time. I recognized qualities in weeds of strength and endurance, enthusiasm and contentment, and perhaps most important of all, the ability to flourish no matter what. And so, I am one with weeds. I celebrate them now and continue to welcome their inspiration. I like how they live their lives and how they can influence mine. I too like weeds but after reading this, I will look at them in an even more endearing way. You made me think of why I liked weeds so much and I realised that one doesn’t sit among the flower beds but one sits on hillsides and parklands where weeds are. They represent rest and nature and yes, I marvel at their struggle as well. They come in all shapes and sizes and they can be thick and chunky or wispy and wild. Thank you for a lovely post, you made me fall in love all over again with weeds. Oh my dear, dear Random Rose! Your words of appreciation are so eloquent. Thank you so very much. I do believe we are kindred spirits. My dear, have a weederful day! Ntexas99, thank you so much! Some days the words flow. Other days I struggle. But, I’m happy with this one as well. I hope life is treating you well.